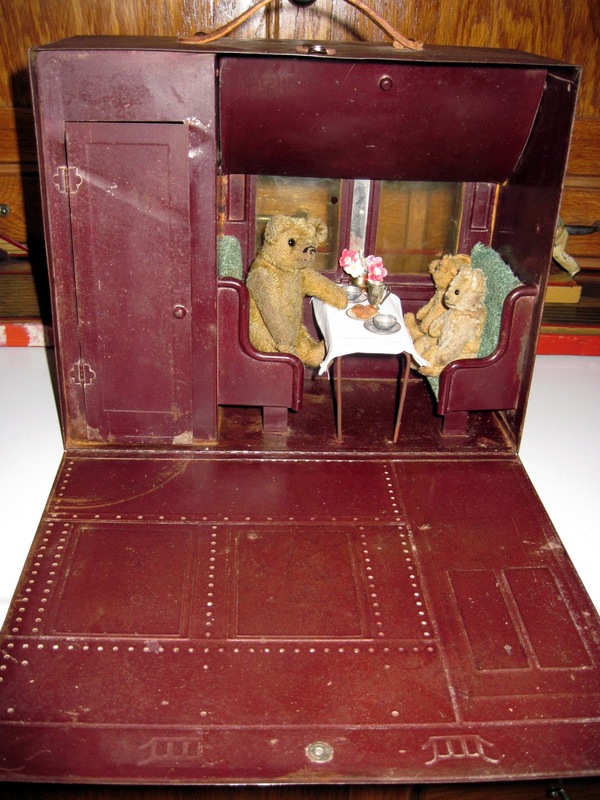 About 25 years ago, when I first started collecting teddy bears, I saw an interesting antique toy mentioned in one of my reference books. In a chapter of hints for displaying miniature bears, the author had posed several tiny teddies in an old tin playset called the Playskool Pullman. I had never heard of this toy, and I was immediately captivated. 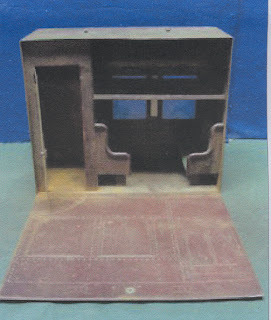 The tin Pullman car looked like a miniature suitcase from the outside, and measured 11 1/2 by 9 1/2 inches. A leather carrying handle allowed the owner to easily tote the Pullman along, perhaps on a real train trip. When opened, a miniature train car interior was revealed, complete with a porter's closet, fold-up berth with bedding, and a seating area of benches with a fold-down table. I was absolutely smitten: it was an amazing toy. Big Bear is running to catch the train, but it looks like he's too late. 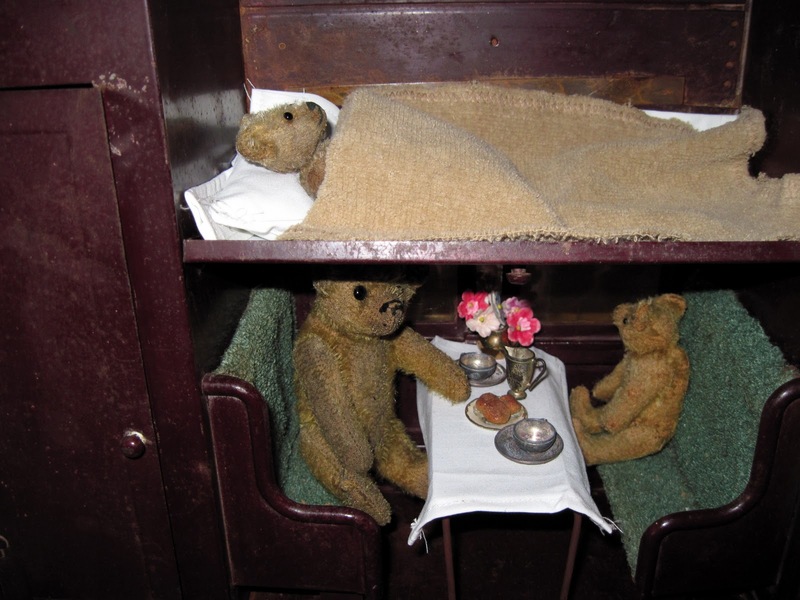 The porter's closet on the left was originally intended to hold the mattresses and bedding, but most Pullman owners convert it into a bathroom, as I did with these antique German dollhouse pieces. falling asleep to the sound of the train clacking down the tracks. That is absolutely darling, I completely understand why it's in such demand. And that's a great restoration, it looks lovely. I can hardly believe the amazing transformation. Great work. That is the most amazing toy. Fantastic. Your mom did a great job. Fantastic find and renovation. I never knew that toy even existed. Great post! Thanks! Glad you're all liking it! This is a very cute display ! 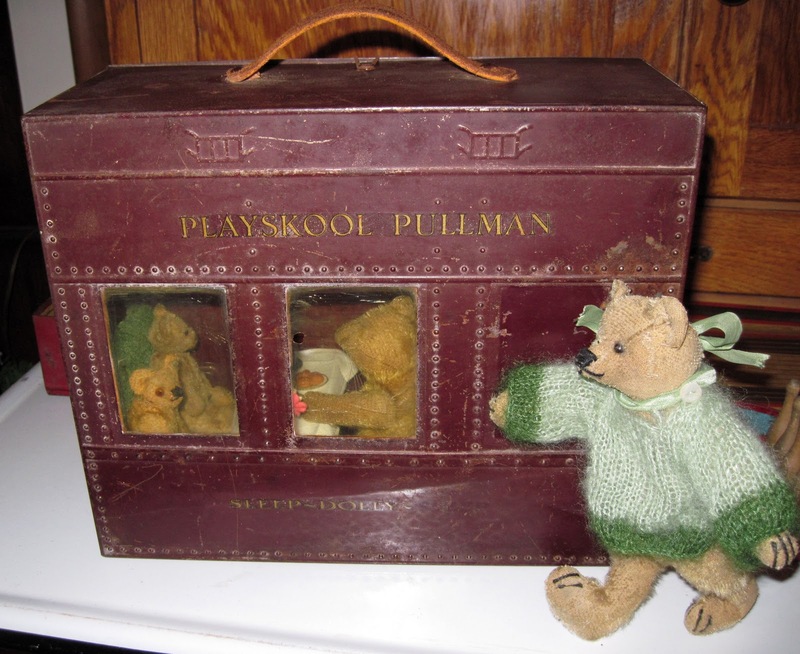 Do you know which teddy bear reference book you saw the Playskool Pullman toy in ? I would like to try and locate it. Thanks for any help you can provide. It was in the very first edition of The Teddy Bear Catalog, by Peggy & Alan Bialosky, published in 1980. 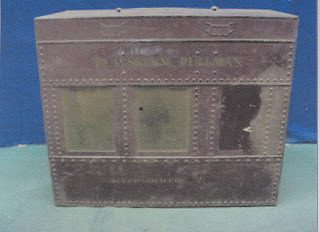 The Pullman is shown on page 208 and described on 209. This was a very early collectors book; the pictures are small, grainy, and black and white, but it was the first place I ever saw the Pullman. Thanks for the info on the book. I will search through my library of reference books to see if I have that one. Sounds familiar now, I loved their bear calendars. Here's a link below to an article, in it on pages 20-21 there is a never played with version of this toy with lots of great info about it. I too have kept a "wish list" of desired antiques for many years. Over time I have found some items and added some additional items to it also. I first saw this toy on an episode of "The Antiques Roadshow" quite awhile ago. I have been trying to locate a copy of that for sometime now. I believe it was on one of the "Junior" versions where children brought toys and other items to be appraised. I was fascinated with this toy when I first saw it but I never thought I would find one. I found mine about 2 years ago in a favorite antique co-op shop from a dealer that always has surprising items. It is still one of my favorite finds. I just discovered your great blog on 8/11/12 and I have it bookmarked to read more in the future. WOW! big applause for that amazing restoration! why don't they make toys like that anymore?? the bears look so cozy in it..
What a find. You guys did a fabulous job sprucing it up. Thanks for the info. I will keep my eyes peeled and maybe I can run across a like item. Lovely! I own a perfect example of this toy. 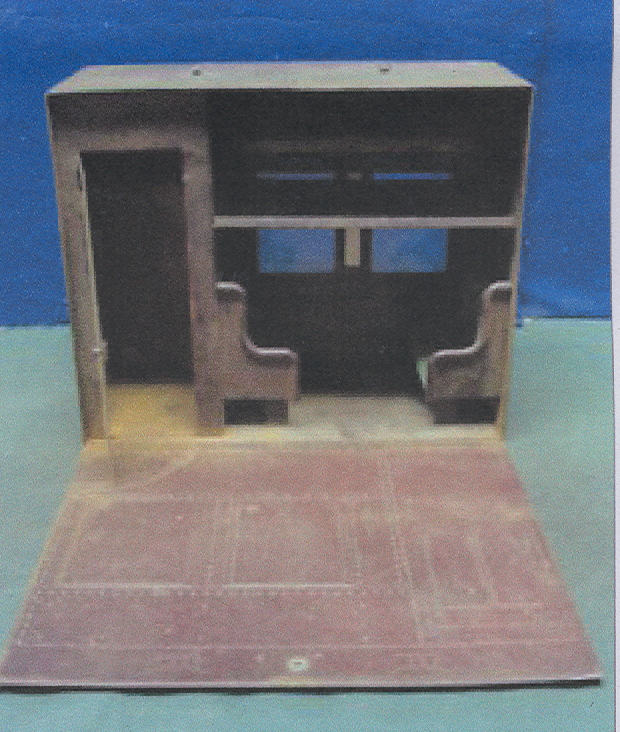 It has the original green colored felt-like bench seat cushions and backs and bunk bed mattress and pillow. It is missing only the leather carry handle. Hi! I've since acquired a nearly perfect example, too, and this one has been passed on to another collector. I'll have to take some more pictures and get the new one posted soon. It too has the original seat cushions and curtains. I have one of these (almost pristine) toys. It in fact came with 2 dolls ... both of which I have. 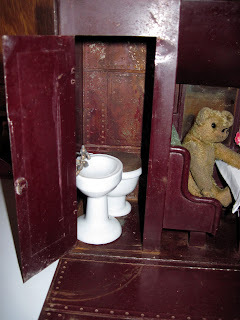 No bears tho.. that must have been because the small bisque dolls are very fragile. Mine also still has the leather strap. I loved playing with this, originally my mothers toy, at my grandmothers house. Too bad they don't make them like this anymore. Hi! 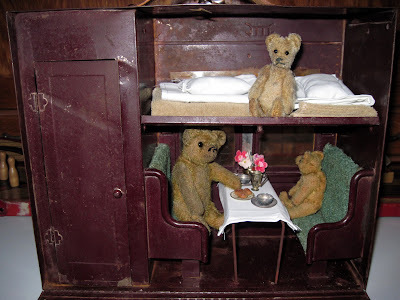 Yes, the Pullman originally came with 2 small bisque dolls, and they are very rare now. Congratulations on still having yours: they're quite a treasure! I have this pullman. It was given to me as a birthday present by my aunt and uncle in Upper Michigan when I was 8 or 9. It has all the bedding and the green cushions that make up the seats. It didn't come with any dolls or teddy bears. It must be over 75 years old as I am 85 years. I would be willing to sell it to a collector. I have no idea of the value.